Our mission is to conduct and stimulate research, education, and health promotion programs aimed at enhancing the health and well-being of agricultural, rural and remote populations. World leadership in health of rural people. 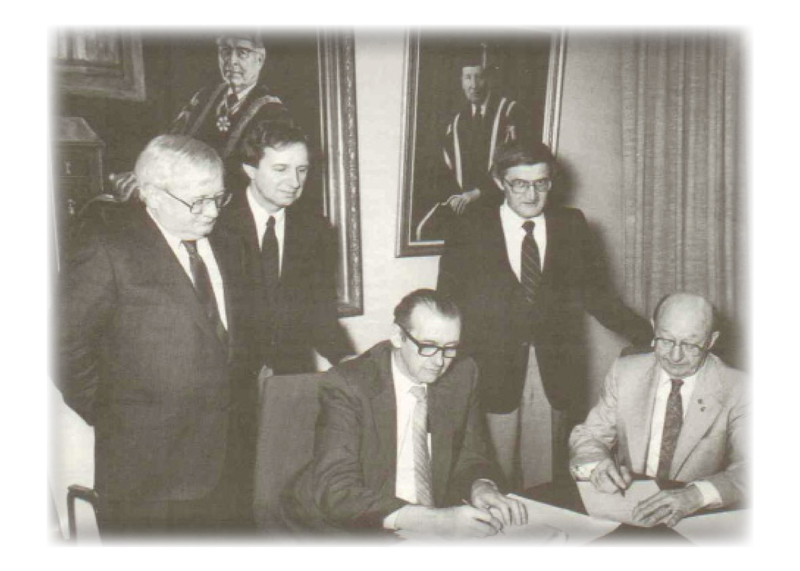 On January 9, the agreement establishing the Centre was signed by Dr. Leo F. Kristajanson, President, University of Saskatchewan; Mr. J.W. Churchman, President, Saskatchewan Lung Association; Dr. Ian MacDonald, Dean of the College of Medicine and Dr. R. Marvin Bala, Head of the Department of Medicine with Dr. J. Dosman as the new Director observed the signing. The agreement spelled out the objectives of the Centre including delineating health hazards in agriculture and related industries, carrying out and stimulating research into known or suspected health risks, establishing a reporting centre for agriculture-related risks, establishing a resource centre for information in this area, and stimulating health protection programs for workers engaged in agriculture and related industries. A Board of Directors was established representing various interests. It was agreed that the Centre would start modestly with the appointment of a Director who would report to the Board of Directors for organizational activities and to the Head of the Department of Medicine for matters related to academics and departmental resources. Funding in the amount of $25,000 per year for five years was committed by the Saskatchewan Lung Association. The Centre was launched and functioned from the top of Ruth Day’s desk. (See Appendix 1 for copy of the original agreement establishing the Centre). Dr. James Dosman and Dr. Helen McDuffie became the first faculty. The Centre contracts with Labour Canada to manage the database for the National Grain Dust Medical Surveillance Program. This rich database would ultimately provide numerous publications and provide the information for the PhD Program of Dr. Punam Pahwa. With the leadership of Mr. Ike Thiessen, President of the Saskatchewan Association of Rural Municipalities (SARM), and Louise Hagel, our Occupational Health Nurse, the first municipal-based outreach program in association with local rural municipalities that provided leadership and funding, was started. The Network, providing outreach services, teaching, an annual newsletter, and yearly theme packages was to grow to involve 203 municipalities enrolling more than 29,000 farm families in Saskatchewan by 2011. Louise Hagel, RN, then an Occupational Health Nurse in the potash industry and herself living on a farm with her husband and children, brought the first Occupational Health Program to the Centre. Initially earning her own salary by selling occupational services to the pulp and paper industry, Louise established the occupational health programming in the newly established Agricultural Health and Safety Network and laid the groundwork for the program. In addition, she established our business of selling occupational health and safety services to the grain companies and some swine producing companies in Saskatchewan. Louise obtained her MSc in injury epidemiology in 2002 and has been pivotal in our current injury studies with Dr. Will Pickett of Kingston. Through the intervention of Dr. Walter Podiluk, then Deputy Minister, Ministry of Health, Province of Saskatchewan, the Department of Health began financial support for the Centre in the amount of $50,000 per year in Dr. Podiluk’s words, “provided that there are matching funds from the private sector”. Dr. Podiluk later joined the Centre on a part-time basis and was pivotal in our private sector “Founding Chairs Development Fund”. The findings from the 1985 Symposium, published as Dosman, JA, Cockcroft DW (eds.) Principles of Health and Safety in Agriculture, CRC Press, Boca Raton, Fl. 1989 provided the scientific basis for the development of the Centre. Dr. Yue Chen became a Postdoctoral Fellow bringing skills in public health and epidemiology, and then became a faculty member. Louise Hagel, Occupational Health Nurse and a farmer, telephoned regarding a possible position and was instrumental in establishing the occupational outreach and municipal outreach programs of the Centre, ultimately obtaining her MSC in injury epidemiology and continues to lead the Centre in this area. In 1989, a young nursing student Shelley Kirychuk organized our studies on lung health as a result of drifting salt dust at Old Wives’ Lake and ultimately became a faculty member in the Centre in Occupational Hygiene. Under the chairship of Mr. Fred Mitchell, President of Intercontinental Packers Ltd.; Mr. David Pitt, President of Massey-Fergusson Industries Ltd.; and with material assistance of Dr. Walter Podiluk, former Deputy Minister of Health, Province of Saskatchewan; Mr. Vern Leland, President, Federated Co-operatives Ltd.; Mr. Harold Empey, former Corporate Secretary, Federated Co-operatives Ltd.; and Mr. Garf Stevenson, President, Saskatchewan Wheat Pool, a fund of $2 million was established by 1994. This fund was to grow to $5 million as a result of outstanding participation by the co-operatives, private sector agriculturally-oriented companies, and individuals. The Senator Norman A. Paterson Visiting Professorship was established as part of the Founding Chairs Program. The Centre moved into new quarters on Wing 3 DE of 1955 building Royal University Hospital and was to stay there until moving into the new lab in 2013. Dr. Ambikaipakan Senthilselvan and Dr. Karen Semchuk joined the Faculty and both remained until the year 2000. In order to further profile issues in agricultural safety and health, the Centre organized the Third International Symposium “Agricultural Health and Safety: Workplace, Environment, Sustainability”, May 10-15. Supported by NIOSH, the Northwest Foundation, and numerous private sector entities, Dr. Helen McDuffie led in publishing the “purple” book, Agricultural Health and Safety: Workplace, Environment, Sustainability with Helen H. McDuffie, James A. Dosman, Karen M. Semchuk, Stephen A. Olenchock, Ambikaipakan Senthilselvan as co-editors (published by CRC Press in 1995). a Saskatchewan Coalition and a National Coalition for Agricultural Safety and Rural Health were established. The results of the Regina Conference were edited into what was to become the guiding document for the development of a national program: Dosman JA, McDuffie HH: Toward Human Sustainability in Agriculture: Policy Strategies for Agricultural Safety and Rural Health in Canada, University of Saskatchewan, 1984 (Vers la Viabilité des Ressources Humaines en Agriculture: Un Plan D’Action National Pour la Santé et la Sécurité Milieu Agricole au Canada). The Centre invites the Canadian Federation of Agriculture (CFA) to host a national meeting to further broaden support for a national initiative. The conference, “Agricultural Safety and Rural Health: Toward a Common Agenda”, took place in Saskatoon June 10-11. The result was the formation of the Canadian Coalition for Agricultural Safety and Rural Health and recommendations that the event lead to a Canada-wide program and a specific Saskatchewan program aimed at support for research as well as preventive activities in Saskatchewan and in Canada. The Premier of Saskatchewan, Mr. Roy Romanow, was the guest speaker, and the speaker on behalf of the federal Department of Agriculture, Mr. Terry Pender, Director General, Adaptation Division, spoke on behalf of the federal government. Mr. Pender was to become a key driving force in the establishment of the future program. Following the annual meeting of the Federal, Provincial and Territorial Ministers of Agriculture meeting in Charlettown, Mr. Pender wrote Dr. Dosman inviting the Coalition to formulate a plan for a national farm safety program in Canada and to present a plan to the Ministers’ meeting the next year. The Centre then organized on behalf of the new Coalition in organizing the “Implementation Conference: Agricultural Safety and Rural Health”, November 4-5, in Toronto. This conference considered the recommendations of the “Towards a Common Agenda” conference and prepared the basis of an Action Plan for agricultural safety and rural health in Canada. With Dr. Yue Chen, now a faculty member, as Principal Investigator, Centre faculty and staff conducted another highly successful canvass of lung function in the Town of Humboldt. This time, stressing genetics, the Study was to yield numerous publications concerning environmental and family aspects of respiratory health in rural people. In a unique agreement between the University, the College of Medicine and the donors of the Founding Chairs Development Fund, the University of Saskatchewan under the leadership of President J.W. George Ivany agreed to an on-going budget line for the Centre in a move that ensured the Centre’s long-term stability. The Canadian Coalition for Agricultural Safety and Rural Health (now the Canadian Agricultural Safety Association) was gathered together by the Centre to represent farmers, researchers, government and industry who shared a common objective – to improve the health and safety of rural Canadians. The central concept of forming the Coalition was that the Coalition would not itself undertake extensive activities, but would be the glue to bind together and support prevention and research activities by its members in a common purpose with each of the founding agencies (The Centre for Agricultural Medicine at the University of Saskatchewan; Farm Safety Association Inc., Ontario; The Canadian Federation of Agriculture; and Ford New Holland Ltd. of Winnipeg) bringing their best gifts to the table. In addition, one Board member from each province was invited to bring input, and each federal Department of Agriculture provided a representative to an advisory process. The Coalition had an administrative Council of 15 Directors from across Canada which was Chaired by Dr. James Dosman with Maura Gillis-Cipywnyk serving as a resource person. The Saskatchewan Alliance for Agricultural Safety and Rural Health (subsequently named Saskatchewan Alliance for Safety and Health in Agriculture) with the objectives of bringing together all the agencies in Saskatchewan with a commitment to agricultural health and safety. With Dr. Hartley Fortin as Deputy Minister, the Ministry of Agriculture made the decision to join hands with the rural municipalities in financially supporting the Agricultural Health and Safety Network. As funds for prevention were the most difficult of all to raise, this involvement not only provided much needed financial support in the amount of $100,000 per year. With funds from approximately 60 participating municipalities at the rate of 1/10 of 1 mill of taxation, and with grants from the newly-formed Canadian Agricultural Safety Program, the Occupational Health Program for farmers developed in-depth strength in respiratory testing, hearing conservation, injury control, and pesticide management. Commenting on the progress of the Centre during its first ten years, Dr. Henry Friesen, President of the Medical Research Council of Canada, observing the mix of farmers, members of the Hutterite community, co-operative executives, private sector company representatives, health and safety prevention professionals, University officials, and Centre students, faculty and staff, states that “the Centre is a model for Canada” in research development. In autumn, 1996, Donna Rennie, RN, completed her PhD studies and successfully defended her thesis in asthma and wheeze in rural children and joined the Faculty in Nursing and the Centre. With the increasing recognition of the broader aspects of rural health and safety, the Centre organized the Fourth International Symposium “Rural Health and Safety in a Changing World”, again supported by NIOSH and numerous Canadian agencies. This Symposium led to the development of the Canadian Rural Health Consortium with Dr. Martha MacLeod of University of Northern British Columbia and Dr. Dosman leading a national drive for co-operation on rural health issues, supported by grants from the Medical Research Council of Canada and then CIHR. The Canadian Rural Health Research Society, with head office at the Centre, became a national incorporated entity in 2001, and was to celebrate its tenth annual scientific meeting in New Westminster, British Columbia in 2011. Dr. Debra Morgan, RN, who completed her PhD in Dementia Care in 1996 and took up a postdoctoral fellowship in the Centre that year, became a Faculty member in 1999. Dr. Morgan’s groundbreaking work in rural dementia care was to result in a CIHR Chair in Health Services and Policy Research for the Program Health Care Delivery across the Continuum for Rural and Remote Seniors with Dementia in 2009. ﻿faculty in the year 2000. Dr. Punam Pahwa who began in the pre-Centre days of 1985 as a student, and who worked in the Centre at the master’s level in Biostatistics from the beginning, completed her PhD studies in Statistical Methods in Longitudinal Design in 2000. She joined the Faculty of the Department of Community Health and Epidemiology in 2000 and continued as a faculty member in the Centre. As a result of the Fourth International Symposium, it was recognized that a broader mandate might be helpful to accommodate the increasingly diverse role of the Centre as a research, outreach, teaching, and service organization in all three of health and safety in agriculture, rural health, and occupational health. Accordingly, at a gala event chaired by Dennis Banda, President, Federated Co-operatives Ltd., and LuAn Mitchell, President, Mitchell’s Gourmet Foods, the broader mandate was presented to the stakeholders that we reach into the future with the development of I.ARE.H. Recognizing the need for a national research training and development program in agricultural safety and rural health issues, we invited the Universities of Dalhousie, Laval, Queen’s, Alberta, and British Columbia to participate in a CIHR ‘Strategic Training Initiative in Health Research’ entitled “Public Health and the Agricultural Rural Ecosystem” managed by Shelley Kirychuk. “PHARE” as it came to be called, was to become an outstanding co-operative program for training at the masters, PhD and postdoctoral levels, anchored by our University of Saskatchewan three-credit class, “Public Health and the Agricultural Rural Ecosystem”. Dr. Bharadwaj spent a postdoctoral fellowship in the Centre before joining the Faculty in 2002 prior to taking up a faculty position in the College of Nursing in 2005. Building on the National Training Program ‘PHARE’, CIHR Institute of Population and Public Health funded our application (also top-rated in its category), “Public Health: Canadian Centre for Health and Safety in Agriculture”. This grant, part of a Centres for Research Development Program of CIHR, provided the glue for scientists and students from 14 Canadian universities and international colleagues to unite more than 50 researchers, their students, and their knowledge translation activities. This project paved the way for a re-evaluation of the mandate of I.ARE.H and its future focus. Recognizing the increasingly focused leadership that we were playing in agricultural health and safety research, prevention, teaching, and service, our Board of Directors decided to rename us as the Canadian Centre for Health and Safety in Agriculture (CCHSA). At the same time, the University of Saskatchewan Council approved the CCHSA as a “cross-University Centre” reporting to the Vice-President Academic, who in turn requested that the Dean of Medicine represent him in providing on-going supervision in the maintenance and development of the Centre. The Centre was fortunate when Dr. Rosenberg moved his office from the Department of Pediatrics where he is Head of Pediatric Rheumatology to join our research grouping in the Centre. The University Board of Governors approved the establishment of a not-for-profit company, Agrivita Canada, governed by a national board. Agrivita Canada is designed to be the instrument of CCHSA in situations where a non-profit corporation can provide for advantage. Funded by the Canada Foundation for Innovation, our application to provide for a national laboratory facility to conduct research, knowledge translation, education, and service in the entire field of agricultural industrial hygiene was established. To occupy the main floor of the new Health Science “E wing”, this state-of-the-art facility will include laboratories including a Respiratory Exposure Lab, Environmental Health Lab, Occupational Health Lab, National Injury Control Lab, Rural Health Lab, Environmental Epidemiology Lab, Commercialization Lab, Knowledge Translation Lab, and Ergonomics Lab. It is envisaged that the National Lab will provide the hub for a co-ordinated sophisticated approach to agricultural safety and health in Canada amongst fourteen participating universities in Canada and worldwide partners. Having first worked on the Old Wives’ Lake project before the Centre was formed, and then excelling as professional researcher, masters student in Occupational Hygiene in Iowa, and acting as the Centre manager, Dr. Shelley Kirychuk completed her PhD in Occupational Hygiene and joined the Faculty of the Centre in 2007 and was recently awarded a SHRF New Investigator Establishment Grant. Following an international search, the Centre was fortunate in the appointment of Dr. John Gordon, Professor in the Western College of Veterinary Medicine, as Director of CCHSA. Dr. Gordon is an internationally recognized researcher in the area of asthma, is a member of the Board of Directors of the Saskatchewan Health Research Foundation, serves on scientific committees of the Canadian Institutes of Health Research, and was most recently named a Distinguished Researcher of the University of Saskatchewan at the spring, 2011 Convocation. Our CIHR ‘Strategic Training Program in Health Research’ (PHARE) took on a new dimension by including additional Canadian universities and an exciting international perspective. The grant was successfully renewed under the leadership of Dr. Gordon in an expanded international version as the top-rated application in its group. The program continues to foster the careers of students at the masters, PhD and postdoctoral levels thereby addressing the vital issue of capacity development by directing bright young scientists into the fields of agricultural safety and rural health as exciting choices. Having completed his masters degree in Epidemiology under Dr. Donna Rennie, and his PhD under Dr. Senthilselvan, Dr. Lawson joined the Centre Faculty in 2009. He recently received a SHRF New Investigator Establishment Grant and a CIHR-Lung Association of Saskatchewan New Investigator Salary Support Award. 2016 – We are now 30! The students, staff and faculty of CCHSA recognize the outstanding support of levels of government, granting agencies, rural municipalities, prevention professionals and their organizations, fellow scientists and educators, and above all, the farmers and rural people of Saskatchewan and of Canada. Many people have contributed generously to the on-going growth and development of our mission although only a few have been mentioned. The Centre has been, and continues to be, very much a living organism that continues to develop and thrive on a daily, weekly and yearly basis.